You’ll find a lot of tips on this site to help you improve your game, and I’d like to think that everyone from beginners to very good amateur players can find something to take away to the Golden Tee machine the next time they play. But what happens if you seem to “max out” at a specific skill level? Are there things you can still learn to help break through and improve your game even more? 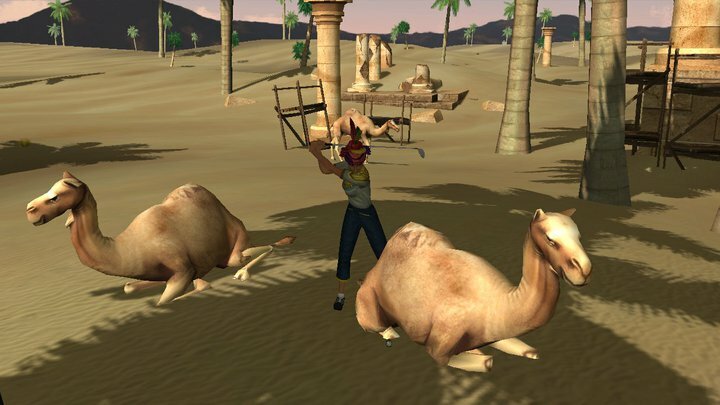 Well the friendly folks who frequent the Underdog forum started up a thread on aspects of the game that have helped THEM get to the elite level where they currently stand, and I wanted to pass their comments along to you! So, I’ve broken down these comments (and added a few of my own) into skill brackets, with 1 being a beginner and 10 being a pro. Try to find yourself within this range, and then read the comments corresponding to that level to see what you can work on to make your game even better! Welcome to the wonderful world of Golden Tee! Here you’re learning the nature of the trackball, how to curve shots (whether intentionally or unintentionally), and how roll and backspin affect your shot. You’re starting to understand how to play the elements (wind and rain), and you learn how much wind affects the ball on each shot while also learning how rain kills the ball (especially now on 2010). You also know to club up or down based on elevation changes. Expanding beyond palming every shot, you learn to thumb and how thumbing distance differs from palming distance. You’re getting consistent with your short putts, making most anything under 30 feet. You’ve learned how to play more break on uphill putts and less on downhill putts, and, more importantly, you’re figured out which putting approach works best for you (palm or thumbs). You’re really starting to consider the loft of your club with each shot, learning when it’s best to choose the 5-wood over the 2-iron, or vice-versa. You’ve also gotten out of the habit of using backspin on every approach shot into the green. Instead, you know the best conditions to use backspin and roll based on the slope of the green, the wind, the pin placement, and the loft of your club. This helps you put more approach shots close to the flag. You’ve added more shots to your game, such as pullback thumbs, pullback palms, and hammer shots, learning how each of these can increase/decrease distance of any given club. You’re learning the carry distances of each club to know when you can/can’t carry a rough lie. You’ve almost eliminated rollover putts by pulling back to C slightly and hitting it smoothly forward. You’re effectively cutting the ball into the wind when the situation demands it. You know when to put your ego aside and club-up instead of trying to pound one less club and coming up short. You’ve learned shortcuts on many holes that give you an advantage over a novice. You’re also getting more comfortable playing with different clubs and balls, and you’re not afraid to change clubs on a course where you know it will give you an advantage. 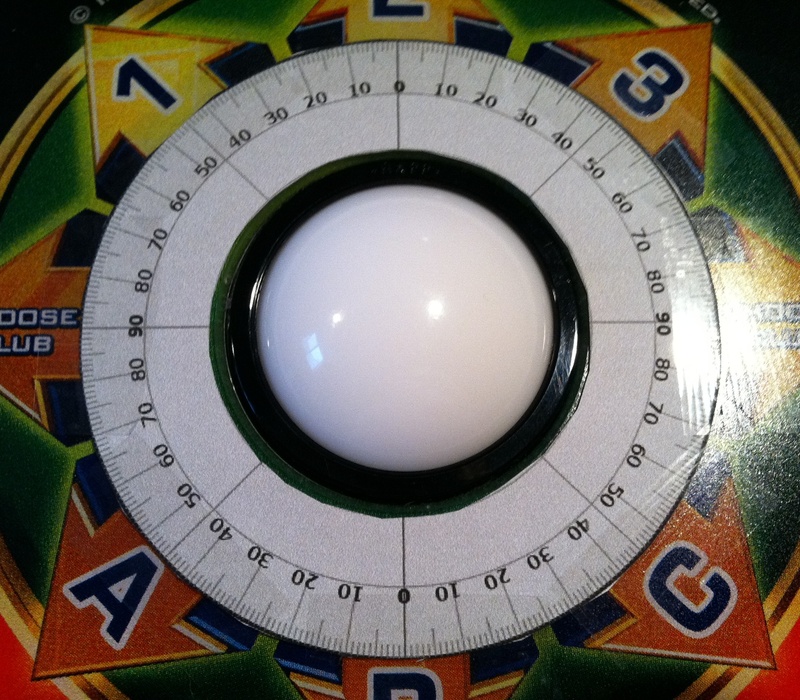 You really understand how the trackball is designed and how it works, and, because of this, you understand how spinny and non-spinny shots differ. You also avoid the trackball issue by a non-spinny C3 shot that happens when you hammer it out towards 3 and make the ball “jump” off track, causing your ball to come off straight ahead instead of out to the right. You’re able to accurately shoot B1 and B3 shots when needed. When there aren’t many other factors to consider, you try to line up your approach shot with the wind to give yourself the best chance of putting an approach shot close. Also, you know where to leave approach shots distance-wise to have specific clubs into the green. You make almost every putt within 50 feet, and you’re pretty good at bump-and-run chips with a single-club, like a 7-iron. 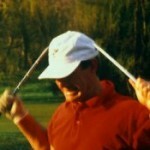 You respect the wind, especially with your wedge, rotating once or twice when needed. You know where NOT to go on each shot, avoiding foolish mistakes most of the time by being smart. Finally, you’ve come across the “old birds” (the 2005 hybrid set) and have learned how they can help you. 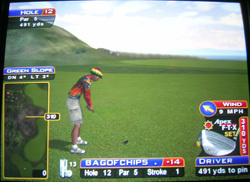 You’re able to hole-out bump and run chips with many clubs, depending on the situation. You’re consistently hitting the ball smoothly to generate power as opposed to just hitting it hard. You can feel the correct angles of your pullback and follow-through, so you will reset your pullback until you know it’s right, and you’ll know upon impact whether or not your follow-through is on line. You’re able to consistently make 70+ foot putts because you understand how they differ from putts under 65 feet. You know how and when to thumb long, big-breaking putts as opposed to palming them, especially big left-breaking putts for right-handers. You’re in the good habit of keeping your hands clean and dry before each shot. You’re effectively scoring Great Shot Points to help you in the standings. Finally, you’re able to avoid going on tilt after a bad shot, and you know when it’s time to stop playing because other influences are affecting your game. You’ve got your distances mastered in any situation, including 3/4 shots like a 200-yard 5-wood. You also know how much to club up when shooting through that tree because you know how much the tree will knock it down. You’re getting good at cutting chips into the break, which help them roll out more consistently and enable more hole-outs. You’ve been playing in tournaments to help build experience. Finally, you have a good understanding of your own personal strengths and weaknesses, and you’re not swayed into straying outside your comfort zone when competing with others. You instinctively know the exact loft of your clubs from an unseen lie, which allows you to clear an obstacle or avoid a big mistake by going around. Your chipping is outstanding — you are not afraid to chip out of the sand or onto a lofted green aggressively to a front pin, when the penalty for coming up short would be at least 1 stroke. You’re also able to nail chips with severe side slope. You have the confidence that you can make any shot if you have to have it. Your goal is to hole-out almost every approach shot, and you’re able to do this once per round on average. You don’t miss putts, and you make almost every chip. You’re having a lot of success in tournaments because you’ve mastered the mental game as well as the physical game, and your opponents are scared to play against you when money’s on the line! And finally, at ANY level, it’s ALWAYS beneficial to play with, and learn from, players who are better than you! Whether that be at your local bar or at a tournament half-way across the country, you can always learn something new from that other guy. 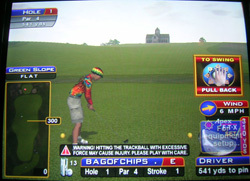 So, try to incorporate friends and Golden Tee pros alike into your routine, and I guarantee you’ll come away with some tips to help your game! 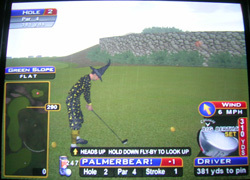 Well I had another fantastic time at a Golden Tee tournament — this time driving out to Cedar Rapids, IA for the action. I got to the Double Inn by 4:00 on Friday. The setup was fantastic — there were 15 pedestals set up all around the perimeter of the seating area. With only 39 participants, there was always plenty of room to get in a game any time you wanted, all weekend. And the cost of prize play was lowered to $2.50/game by the vendors, so that saved everyone quite a bit of cash on the games too! The vendors did an outstanding job staying organized and keeping things running, so if you can make it next year, I’d recommend it above all other tourneys! It took a bit to get used to the pedestals again. You have to get used to the putting a bit, and a lot of my approach shots were coming in long. Still, after you get used to them, there’s nothing else you’d rather play on. I’m not looking forward to going back to the old school machines after getting used to the big flat screen all weekend! Friday night brought a lot of excitement. There was a blind-draw doubles tournament, and I was hooked up with a dude named Chris Dilly from Omaha. Unfortunately for everyone, the top 2 qualifiers (Kinz and Mouth) got paired together. And unfortunately for us, we had to play them in the first round! As it turned out, this was the most exciting match I’ve ever been a part of in my short tourney career. We picked up a couple strokes early on, and then Kinz and Mouth kept chipping over the green on Black Hills hole #5, getting a 7 on that hole! So after 5 holes, Chris and I were up by 5 strokes — can you believe it?! As you may have guessed, they chipped away at that lead, getting 3 strokes back on hole 11 with an eagle while we bogied. They tied it up later on and we were all square at -18 after 17 holes! Mouth put it pretty close on the fringe on 18, and I stuck the green! Kinz made the putt, and then Chris had a tough, long right-sloping putt that didn’t quite go in. He had been money with the putter all day, but we couldn’t get that one to fall, so we lost -20 to -19. We also lost the next match, not playing as well, and Kinz/Mouth never lost a match on their way to the doubles title. Still, I’ll always have the memory of this fun match! Qualifying was great with 39 guys on 15 machines — there were either 2 or 3 on each machine, and we got to play a full 5-course qualifier. It started at 12:30 and ran until 5:30. For some reason, I still get really nervous playing qualifying matches, and I had a horrible front nine (-9) on Grand Savannah to start. I recovered really well on the back, putting up a respectable -20. But, it never got better than that. I went -18 on Woodland, -15 on Black Hills, -15 on Sunny, and -20 on Bonnie…not very good. I was missing putts and just not executing well, and even with those not-so-great scores, I was right on the cut line. The top 24 made the cut to play in the gold bracket, and I ended up #25! My goal was to make the cut, and I failed there, but some exciting stuff was about to happen. The “purple” bracket (which was double elimination) for the 14 guys who missed the cut started at 7:00. I had a bye and then played a dude named Dave on Bonnie. I fell behind by 2 early but recovered well after that, cruising to a 2-stroke win. Then I played an amazing guy from Omaha named Evan. Evan was involved in an awful motorcycle accident that left his right arm paralyzed, which he had in a sling. 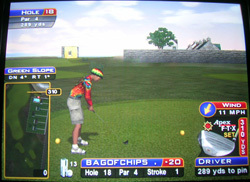 Still, Even was a great Golden Tee player, able to execute every shot and drain every putt using just his left hand. Even made a mistake early and gave me 2 strokes on hole #2, and I kept that slim lead most of the way, finishing with another 2 or 3 stroke win. Next up was “Buffalo” Bill Spruce, and we had an epic battle on Bonnie. We matched each other shot for shot until I took a 1-stroke lead late in the match. Neither of us made more than 2 or 3 mistakes that round, and it took all I had to put up a -26 that edged out his -25! And that was it for Friday night. Since it was true double elim, Evan and Bill would play the next match Sunday morning, with the loser getting third place ($62) and the winner getting another shot at me. Bill played a very clean round on Woodland and closed the door on 17 and 18 with outstanding tee shots. So Bill got a rematch with me, and Bonnie was drawn, much to my dismay — I couldn’t put up another -26 like yesterday! So we battled it out again, with me getting a nice hole-out on 2 to hold a 1-stroke lead for a while. We were tied going into #14, where I drove the green and he ended up on the fringe with the water between him and the hole. 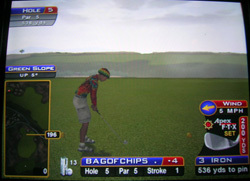 He caught a tough break when his chip went in the water, and I eagled, taking a 3-stroke lead. I was able to hold on from there to shoot a -24 to his -21, and that was it! Bill got $125 for 2nd place, and I got $185 for first in the purple bracket! Needless to say, I was never so happy to miss the cut! It’s always great playing matches against players who share your skill level, where anything can happen and you always have a chance to win! I also found I wasn’t as nervous playing the heads-up matches, although I don’t know why — maybe I was less intimidated and had more confidence knowing I had a good chance against these guys. In any case, if I can make a run like that in the purple bracket, then anyone can — it just goes to show you how well the amateur players like me can benefit from playing in a big tournament! Ever hit a shot and wonder what the heck just happened? Sure you have — we all go through that as we’re learning the mechanics of the trackball and the game itself, and I still ask the same question every now and then when a shot goes awry. The worst thing that can happen, though, is you shrugging it off and not stopping to figure out why that bad shot just happened! As you gain more experience, you’ll start to recognize the source of these problems, and then you can help your friends and yourself learn from these mistakes to become a better player. The first concept beginners have to master is how the trackball works. Some people pull straight back and shoot forward left, expecting the ball to go left, when we know that creates a “schwerve” that ends up coming in left-to-right instead. Realize that the pull-back is more important to accuracy than where the ball starts its path, so focus on pulling back correctly. Another cause is not playing enough wind with a lofted approach shot. Wind can be devastating on wedge shots, so often times you’ll even have to rotate once or twice to compensate enough. What happened: Your approach shot comes up well short of the green (consider the opposite of what’s listed below if your shot just flew over the green). 2) Your playing partner hit his approach with deceptively smooth force, and your “smooth” shot really was not as strong. 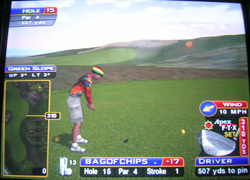 3) Your playing partner is using Golden Tee golf balls that pack more distance than the ones you’re using. 4) You didn’t club up to compensate for a tough lie. You lose a bit of distance from areas like mud and snow, but you lose about 1/3 of your distance when hitting out of tall grass. 5) You tried to put curve on a shot from the rough. This KILLS distance. From the rough, you have to either play it straight or club up several times if you’re attempting a cut shot. 6) You tried to carry an island green with a low-lofted club (many times it’s better to club up to the 5-wood and hit a softer shot). 7) You tried to thumb a shot too softly. Some machines don’t read this type of shot correctly, and you’ll end up way short. If this happens repeatedly, try pulling back 3/4 of the way and hitting a full thumbs shot. Your attempted A1 or C3 shot took more of an A2 or C2 path, crashing into whatever was in front of you. Sometimes the trackball reads these funny if you don’t hit a “spinny” A1 or C3. 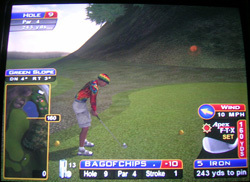 I had problems for so long on Cypress Cove #9, where you can often play a C3 around the mountain cliff onto the green. I would pull back towards C, let the ball stop spinning, and slam it forward towards 3. Instead of shooting out right, it would slam right into the mountain straight ahead. Either the way I was hitting the shot or the machine itself (or both) contributed to the problem, but once I started to keep the ball spinning on my backswing before I shot forward to 3, I saw a nice, consistent ball path. 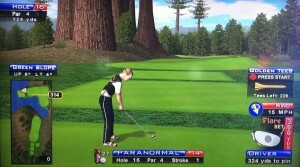 Note that the “spinny” adds distance to your shot, so you might want to club down to help fix this problem as well. Finally, I’ve found that using thumbs to shoot forward on a non-spinny shot works consistently most of the time also. What happened: You miss an uphill putt by not playing enough break, and then you make matters worse by playing too much break on the comeback downhill putt. It takes a while for newer players to get used to how uphill putts essentially have more break than downhill putts. What really causes the break is your ball slowing down as it’s going uphill, but all you need to know if that you’ll have to play as if there’s more break if putting uphill. Practice is the remedy for this, so you really need to consider the uphill/downhill slope just as much as you consider the side-hill break if you’re going to consistently make putts. What happened: Your chip shot from just off the green still comes up short of the green. The surface off which you’re hitting can play a big part here, as can your backswing. There is some nasty dirt on Grand Savannah that seems to force you to hit harder than usual to get out of it and onto the green — I see many people “duff” chips off this stuff because it can kill your shot. Secondly, you can duff a chip by not pulling back far enough. People think they can compensate for not pulling back past their player’s ankles by hitting it forward with more force, but what you really need is the loft off the club at impact. Pull it back a bit farther and hit forward more gently — this helps get the ball in the air and onto the green. As I’ve bridged the gap from 2008 to 2009, I’ve noticed several things to keep in mind during the course of a round that can save you several strokes if you account for them. Alternatively, you can lose even more strokes if you fail to take these tips into consideration! 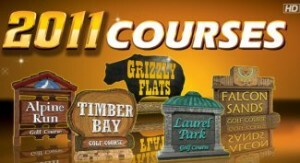 So before you go out and spin some more rounds on the 2009 courses, make sure you’re doing these things below! 1) Club up on your approach shots. 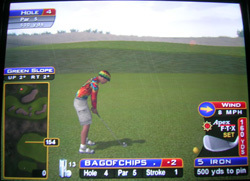 Maybe it’s me, but after my first few rounds on Golden Tee 2009, I noticed that I was often coming up way short on my approach, sometimes even short of the green. I think some of this had to do with elevation changes (which will be another point), but mostly, I just had to club up more often and/or hit with more power into the greens. I see it all the time with amateurs — they fail to club up and try to pound the ball to compensate, and that usually won’t get the job done. So, especially if you’re using backspin or playing a small curve into the green, make sure you’ve got plenty of club to give your ball a chance to hole out! 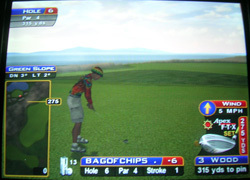 2) Know how to play the wind on steep elevation drops into a green. The best example of this is the first two holes on Black Hills, where you can take a par on either if you’re not careful. 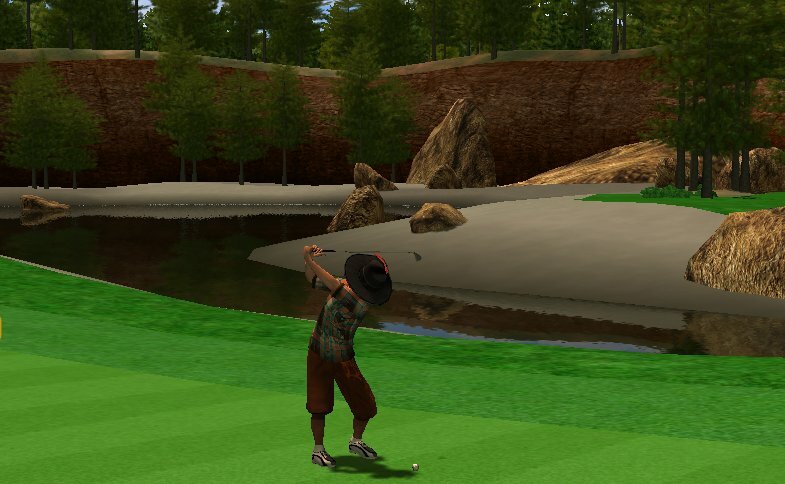 Both holes feature a steep drop in elevation as the ball is sailing into the green, and if you don’t compensate enough for the wind, you’ll be in some early trouble! Tailwinds are easiest to play…club down and let the wind do the work, carrying the ball up to the pin. Headwinds can be tricky, as your ball can be coming straight down. You’ll almost never want backspin on these types of shots, while roll can be quite handy. If you play no spin, make sure the ball will land above the hole, because it’s not going to bounce forward. Also, remember how much more the wind affects the higher-lofted clubs! I think the most dangerous winds are the cross-winds. Not only do you have to nail the distance, but you have to know where to aim as well. The first thing to keep in mind is that even though you’re shooting downhill, a crosswind is going to cut distance more than you think. As that ball is coming down, the wind will take over and it won’t be going forward very much anymore. It’s easy to come up short because you think you’re shooting downhill, so keep in mind the impact of this wind on the distance as well! 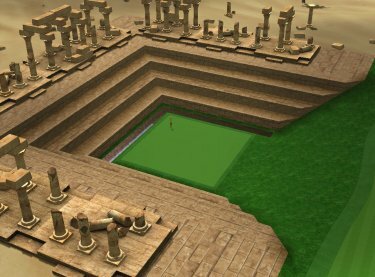 Finally, your aim becomes crucial here too. You’ll usually have to pretend the wind is blowing twice as hard as it’s showing, and aim your shot as if this were true. 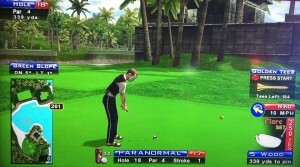 Even when the ball touches down on the green, the ball will continue on in the direction the wind was blowing it! So don’t lose sight of these facts, and you can save yourself from some tough situations. 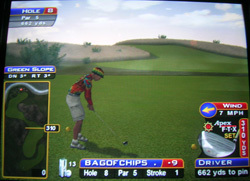 3) Use the Big Bertha clubs on Black Hills. As you’ll notice on the Black Hills writeup, these clubs will make playing the course much easier, and with a little practice, you’ll gain a 2-3 stroke advantage over anyone not using these clubs. Now, if you’re truly a beginner and have gotten comfortable with a particular set of clubs, then it’s okay to stick with that set as you hone your skills. But if you’re playing for prize money, you’ve got to practice with these clubs on this course…after a couple rounds, you’ll see how that 7-wood and 9-wood can greatly simplify some of the shots on Black Hills! 4) Learn how to survive Grand Savannah #17. This hole has gotten more press than any I’ve seen, and with good reason — it can totally ruin your round. If you do NOT have a wind in your face, you’re got a chance at birdie. But if you do, I recommend two things. First, if you aren’t having a great round, play around with a 5-iron chip shot. Don’t use any spin, pull the club back about half-way, and shoot it forward at about 2/3 strength. Take note of where the ball lands and what it does after it lands, and make adjustments to your pullback or shot strength if needed. With enough practice, you’ll have given yourself a good chance at carrying the front of the green, where it will roll up, and back, and stick there! However, if you want to protect a good round, play for par using these steps. First, club way up and aim for the grass/dirt behind the green on the right side. Landing it here is step one. Step two is making a small chip with backspin that lands on or just before this fat part of the green, where it will roll down a ways but not all the way to the water. Step three is making your big-breaking putt! 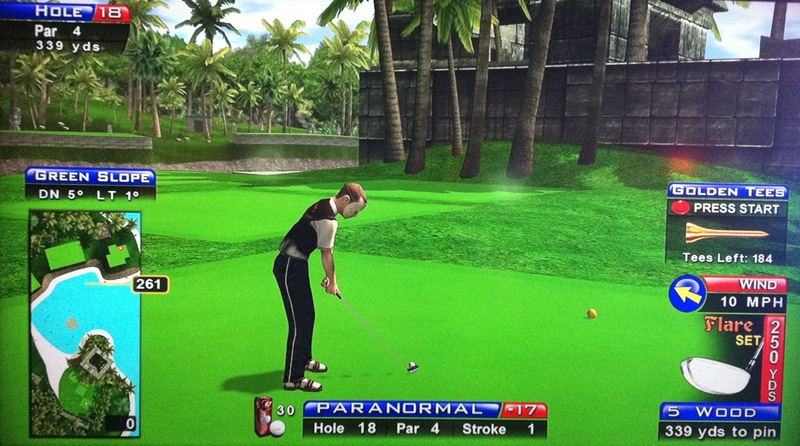 Even if you two-putt for bogey here, you can bet you’ve done better than most guys playing the hole in this condition, and that should hold your rank in the competition! 5) Make your uphill putts. I think the biggest concept of putting that takes amateurs longest to figure out is how to play the break on an uphill putt as opposed to a flat putt (or downhill putt). It’s not technically true that the ball breaks more on uphill putts, but this illusion is created because the ball is slowing down significantly more as it climbs to the hole. All you need to know is that you should PLAY more break on uphill putts, and play less break on downhill putts. It kills me when someone plays too much break on a downhill putt, flies past the hole, and then over-compensates by not playing enough break on the comeback uphill putt, missing again. 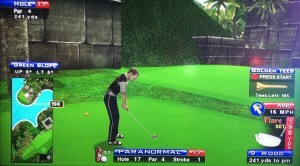 Putting is definitely a touch phase of the game, and only experience can earn you the correct feel for each putt. Still, knowledge of situations like these can be half the battle! 6) Learn low-loft chip shots. 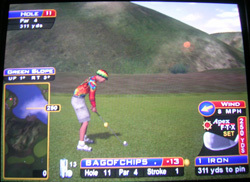 Finally, Golden Tee 2009 is a great time to start practicing your bump-and-run chip shots! Unless you have to carry the pin, you should be thinking of using a 2-iron through a 7-iron on anything under 40 yards. If you’re on the fringe, use a very-low lofted club, pull it back a fraction of the way, and gently shoot it forward. Again, this is a touch shot that takes a lot of practice, but now is the time! Similarly, if you have to carry a bit of rough to the green, club down appropriately to get more loft. Another good idea is to pick one club you will always use for your bump-and-run chips so that you have a better idea of carry and distance each time you use it. Not only will you save yourself a couple shots per round by learning how to hole-out short chip shots, but you will also be more confident attacking the pin if you know you still have a good chance of chipping in from just off the green! 1) Pull the trackball back on almost every shot. I still am not comfortable enough to do this as often as I should. All the pros fight the wind by curving their approach shots into the wind or into the slope of the green to tuck it up by the pin. You also get more loft on your shot by pulling back, which may help you clear water or other obstacles. So, work on practicing the pullback angle with each of your clubs to fight the wind on approach shots into greens with tough pin placements! 2) Club up. A lot of amateurs, including me at times, try to pound the trackball with a shorter club, trying to maximize distance with that club instead of clubbing up and hitting it softer. I often saw these guys club up twice for their approach shots. The difference is that these guys have the touch on distance with their follow-through. While amateurs are pounding the ball forward, these guys simply club-up and flick it forward without much effort, but their results are so much better. If you are ever in doubt about distance, play an extra club and hit it a little softer! 3) Skip off the water when you can! I learned this way too late. There are several holes where you may not be sure whether or not you can clear the water. Well, if you have room to play an A1 or C3 shot with roll, I guarantee your ball will skip across the water if it hits short of land. 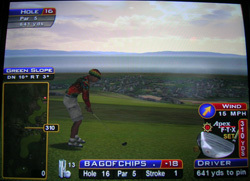 There are several holes in 2008 Golden Tee Live where you have the opportunity to play a big curving shot and skip across water, so keep your eye out for them and take advantage of this trick! 4) Practice your chipping. The pros are not at all scared to attack the pin because they are so good at chipping if they roll off the green. Even from the sand, these guys hole out consistently. I still favor the low-lofted club for chips if I’m just off the green, but these guys even know how to hit a quarter-strength 7-iron out of the sand and hole out. This only comes with practice, but if you can learn how to chip in even once or twice more per round, you’ve saved yourself those strokes at least! 5) Practice your A1 and C3 drives on tough holes. The pros hit these big, curving drives off the tee whenever possible to maximize distance, and they can do so on dangerous holes because they know exactly where the ball will be going. I can still only shoot this shot if it’s pretty wide open. But, these guys aren’t scared to thread the ball between trees and water to gain an extra 20-30 yards because of the control they have. Pay attention to the wind and whether or not to use backspin or roll to help guide the ball where it needs to be! Use these tips to take your game to the next level — good luck! 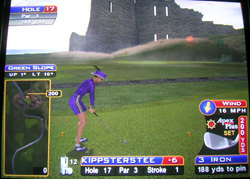 There’s no substitute for practice in Golden Tee, so keep at it! In addition to practicing, there are several other ways to help you improve your game. This section contains tips on how to keep getting better! Know what your clubs can do! 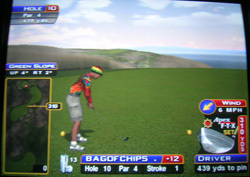 This Golden Tee article was submitted by Baxter — thanks for your comments! Learn the distances with spin, without spin, with varying winds, etc. Don’t blame the hammer if you can’t build a house. As I noted before, I can back up a 3-iron to 177 yards about 90% of the time assuming a neutral wind, no major elevation changes, and not much slope on the green. Learn how your clubs react in the fairway, first cut, rough, fringe, etc. Learn how high a particular club will get off the ground (good for uphill shots). 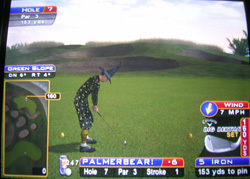 This wouldn’t be encouraged in a normal round of Golden Tee with your buddies, but if you’re practicing a round by yourself, a great tip is to use up some mulligans in specific situations to get the feel on a particular shot. Mulligans aren’t allowed during a LIVE round since you’re competing against others, so play a non-live round to get this option. If you have a bad chip, use a mulligan or two until you get the feel of where to hit the ball. If you’re hitting a big hook off the tee, use a mulligan or two until you get the backswing and follow-through on the right angle. 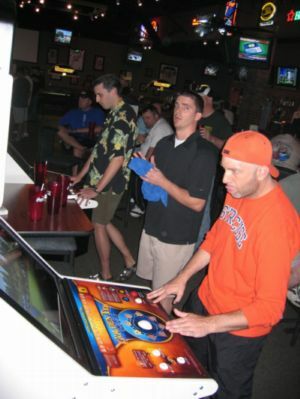 You’ll use up some extra quarters on Golden Tee, but it can sure be worth it when you beat up on your friends! 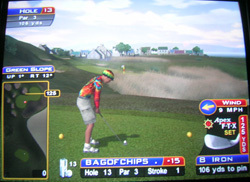 It’s a big advantage hitting second or lower off the tee when you’re playing Golden Tee with a group. The first guy gets to be the scapegoat, and it’s very important to pay attention to the shot he just executed. An important tip is to observe the results and then copy them or tweak your drive to do better than he just did. Not only do you want to hit second off the tee, but you want to outdrive your partner too! If you end up closer to the hole, your buddy has to hit first again, so you can keep observing his shots to help your own! Be careful that you are correctly observing what your playing partner just did, though, or you might overcompensate and hit a bad shot you might not have otherwise hit! 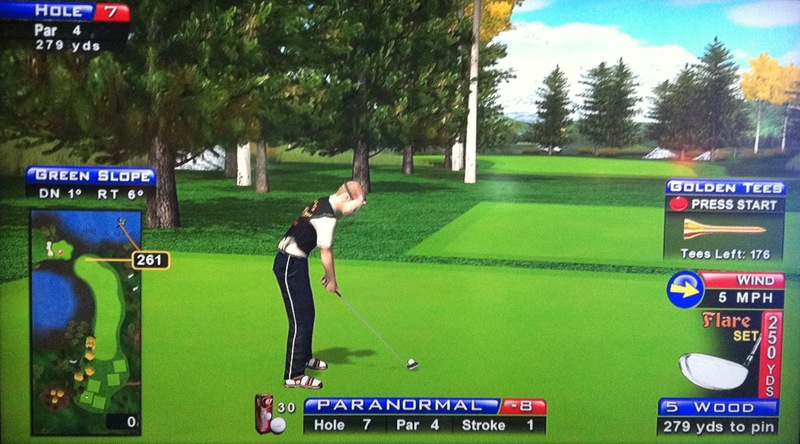 I’ve had several times where my buddy came up short, so I cranked it hard, only to completely fly the green. Take away what info you can, but don’t put all your trust in what you just saw — trust your gut too! Up the Golden Tee competition! 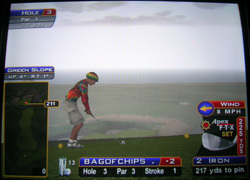 You can learn a LOT by playing with someone in Golden Tee who’s better than you are! Pay attention to each of their shots, and notice all the factors they take into account. Get tips by watching the shot type they play in each of these situations and see how the results play out. 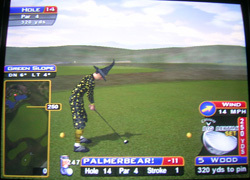 Playing with someone better than you at Golden Tee is a fantastic way to learn new strategies and improve your game!